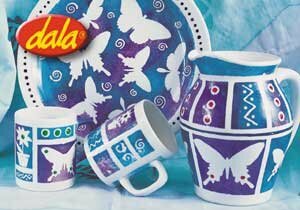 How to decorate your own coffee mug by sponging Dala Ceramics @ Home colours over simple cutout designs and masking tape. Optional highlight colour # 13. Cut your design out of the photocopied picture stencils and place into the bowl of water to soak. Clean the surface of the mug thoroughly using 50 % vinegar and 50% water solution and a piece of paper toweling. Use the masking tape to define square or rectangular areas on the surface of the mug. Arrange the wet stencils on the mug in the design you want. Note that the wet paper stencils will cling to the surface without requiring any adhesive. Fold paper toweling into pads. Mop up any excess water by dabbing the whole surface (and the stencil/s). Make sure that the water does not cause the masking tape to lift. Sponge the Ceramics @ Home colours over the entire surface. You can create exciting effects by varying the thickness of the paint and overlapping the colours. Remove the stencils and masking tape immediately after sponging. Avoid allowing the paint to dry on the stencil, as this will affect the finished quality of your artwork. Use the kebab stick to draw patterns and designs into the freshly applied paint. You may use the kebab stick to paint dots/stripes/lines into the (white) areas left free of stencils and tape. Allow the completed artwork to cure for at least 24 hours before heat setting. Pre-heat your oven to 150’ C and bake for 40 minutes. Allow the oven to cool off before removing your artwork. Increased temperatures may improve adhesion but may darken certain colours. Buff the surface with steel wool to smooth away any roughness resulting from scratching into the paint. Smudged paint or unwanted marks may be removed by scratching off with a kebab stick or by using water on a ear bud before curing and heat setting. Ceramics @ Home will withstand repeated dishwasher cycles (Medium to low heat setting). A slight odor will emanate during baking. Although Ceramics @ Home is a non-toxic product, it is not recommended for direct contact with food. Be sure to paint on the outside of coffee cups or on the rim of plates only. This item has 1612 views.